When assessing the successes and failures of a particular historical figure, consider approaching the task in the form of a “school report”. This can be the basis of a consolidation exercise at the start of the topic, or an intensive and efficient way of covering fresh material step-by-step. Start by identifying the main ‘subjects’ that reports will be required for (e.g. economics, law, politics…) and write these down. Discuss the successes and failures relating to the first subject. Consider how this could be written in the form of a school report (“Tsar Alexander II has had a mixed term in terms of his legal reforms…”, “Adolf has been rather disruptive in his attitude to group work in recent weeks…”). Students tend to have a bit of fun recycling teacherly platitudes at this point and getting in the habit of writing a ‘compliment sandwich’ that starts with something positive, then makes a criticism, then closes with another positive point. Next, provide students with an A3 version of a school report template (see the example below for a study of the Nazi education system, via my website ActiveHistory). They then write the first report in strict timed conditions (I usually list certain keywords they must use too). When the time is up, repeat the process for the remaining subjects. Students should provide an effort and attainment grade for each subject as well as a written comment. This could provide the basis of an interesting discussion. 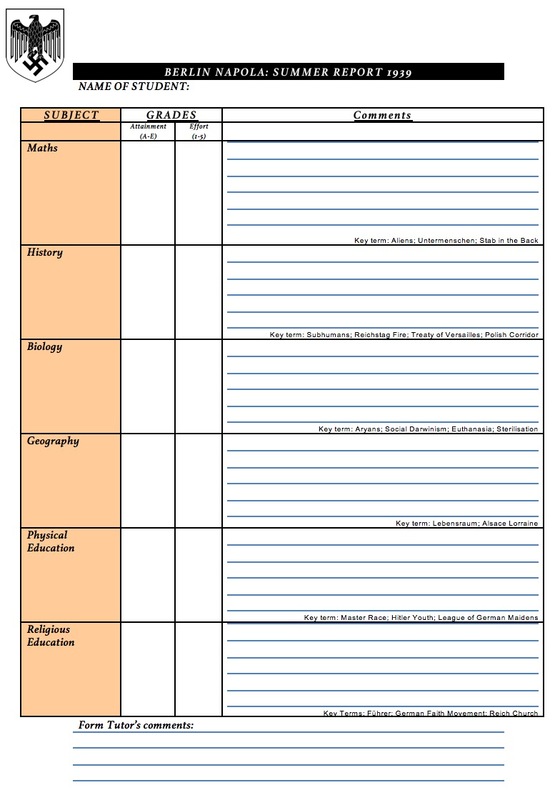 After completing each subject report, students should swap their sheets with another member of the class. In this way, each subject report is written by a different person and looks more authentic when it returns to the original owner. After the exercise is completed, students should underline clear evidence of success in one colour, failure in another. In which subjects was the individual most successful? In which were they a failure?